“Competition is what keeps us playing the psychological warfare of matching skill against skill & wit against wit, until we win, win, win !!! 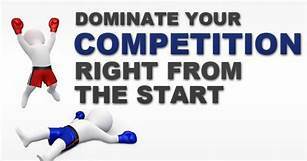 Creating a Competition Strategy: you need to be better in at least three aspects of your Startup or Small Business, if you want to start beating your competitors A) a Gr8 Product, B) outstanding Service & C) the Management of your Business – smooth Execution. 1. Wider range of Products. “Variety is the Spice of life”, but that doesn’t mean you need to be an Amazon. Go narrow niche, then go broad within your Unique FREAK [Friendly, Responsive, Easy-to-Use. Amazing, Killer]. EZ 2 Use. KISS Keep it simple Stupid”. If a customer can figure out how to use your super magic Gadget in a few seconds, you’ve got the edge. 3. Unique. Many Customers are sick of seeing the same mass-marketed products everywhere you go? Offer something your customers can’t buy anywhere else – that has unique capabilities. 4. Design that is more beautiful/quirky/fun/edgy/stylish, etc. Something as seemingly superficial as “appearance” can dramatically alter a customer’s perception of its worth. 5. Better Quality/longer-Lasting. A great way to beat competition, because it makes a higher $$$ justified. Your smallness means you can put in that extra bit of TLC that really makes a better-quality product shine. 6. More Efficient. Does your product get more done than its rivals? Is it faster? Easier to set up and start using? These days that’s an incredibly powerful sales tool. 7. Greener/more Enviro-friendly. Whether it’s recycled, recyclable, or in some small way helps the plight of Tibetan goat farmers, it taps into the biggest consumer trend to save our planet. 8. Locally-sourced/Home-made – City, State, USA. This holds an ever-greater sway, because people increasingly want to know where their stuff has come from. 10. Approved by a respected Organization or Celebrity. A Celebrity Endorsement gets attention. Do whatever it takes for the Trade or Standards organization to approve you, then stick their Approval Seal on every bit of Marketing material you’ve got. Focus on & Improve. Be caring & considerate, build relationships with your customers and respond to any complaints quickly and calmly. It’s that simple. But it’s something most big companies find hard to do well. Employees’ expertise & de meaner (no, demeanour, sp) The best salespeople are those who know their subject matter inside-out. As a Startup or Small Business, you can nail this one, because you’re most likely to employ people with a good dose of passion for what you’re doing. Use it !!! Train staff to know your product well and have the patience to explain it in-depth and make recommendations. Faster Delivery – of Products or Services. Hire a crew of Hell’s Angels if need be, because this one can make or break a buying decision for time-tortured customers. Your Website is more efficient/reliable/quicker/simpler. We can’t say it enough: Websites are window into your Startup or Small Business. Get a good one, and you look professional + encourage people to go there all the time. Offer Online Ordering – when Competition don’t. Convenience is a #1 priority for an ever-growing number of consumers these days. So let them buy your products while they’re browsing the web – and get sales coming in 24/7 (if you can). Offer “Freebies” that Competitors don’t. This can be something simple – but get your product into their hands or an incentive and they will be impressed and refer you to others. Being Area, State or Irrational (no International) The broader your reach will win you more customers and give you an edge over those who only deliver to a smaller area. It takes a lot of organisms (organization) and good planning, but can work wonders. certain Employees wear a Uniform. A small thing, but a powerful one. It makes your business look more uniform, professional & trustworthy – which can go a very long way in getting the sale. Get to know your Competition. Find out who your competitors are, what they are offering and what their Unique Selling Proposition (USP) is. This will identify the areas you need to compete in, as well as giving you a platform for differentiating yourself. Know your Customers. Customer expectations can change dramatically when economic conditions are changing. Find out what matters to your customers now – is it lower price, more flexible or premium service, the latest products? Revise your sales & marketing strategy accordingly. Differentiate. It’s essential to give your customers good reasons to come to you rather than a rival. Your USP should tap into what customers want and it should be clear and obvious. add Loads of Frills deals. Throw in lots of complimentary bits-&-bobs to pamper your customers and they’ll love it & keep coming back + tell their friends. Better Payment options. This is a difficult one if you’re an early-stage business because Cash Flow is so key to your survival, but if you’re longer-established and have enough in the bank to allow a 30, 60 or 90-day payment period, and you have a big edge over more stringent companies. Partner-up for mutual Benefit. Find someone outside of your market or industry who would benefit by your success and they would benefit from yours. Reduces marketing costs. Expand your Offerings. What related products or services might your customers be interested in? You might even consider diversifying into another area that’s you discovered at networking events, news, new developments, etc. Target new Markets. Selling into a > number of markets can significantly increase your customer base. Consider whether you can sell online or overseas, for example. Are there groups you’ve never targeted before who might be interested in your offer? don’t waste time marketing to people who won’t be interested. Update your Image. Simple steps: Social Media presences, your Website, Professional networking, etc. Does your image reflect or improve your USP? Be the “best” Employer. Skilled, motivated staff strengthen a vibrant, growing businesses. But attracting them means more than paying a competitive wage. People are often more impressed by a good working atmosphere, shown appreciation and benefits such as flexible working and structured career development. Giving Back. Encourage & reward your employees for Volunteering; donate a percentage of your profits to Charity, sponsor a group or event. Anything along these lines, modestly publicised, will win customers’ hearts. Plan for Growth. Businesses that plan for growth are more successful than those that are happy to stay stagnant. Keep up with developments in your sector, follow consumer trends, invest in new technology and – crucially – have a clear idea of where you want to be in 1, 3 & 5 years’ time – your Vision !!! Comments: Do you know of any other ways that’s you can beat your Competition?